A new ‘pop guru’ of childrearing turns evolution into profit. Evolutionary psychology (see box below) has been the rage for some time now. Want a handy explanation for why people cheat on their spouses? Why, it’s programmed into our genes by millions of years of evolution.1 Almost every aspect of behaviour has been analyzed in evolutionary terms. The latest outbreak of this fad involves rearing children. So-called ‘pediatrician to the stars’ Dr Harvey Karp is telling parents of unruly children he has ‘the answer’. Realize that your toddler is really going through primitive stages of her evolution, and you can then ‘talk her language’! Enthusiastic converts to this new way of raising children include well-known personalities Madonna, Michelle Pfeiffer and Pierce Brosnan. Karp’s bestseller The Happiest Toddler on the Block makes it clear that he is really giving the old notion of embryonic recapitulation a new face. This idea, bolstered in the public mind by fraudulent embryo diagrams,2 taught that the baby in the womb goes through the stages of fish, then amphibian, to reptile, etc. It is now regarded as utterly discredited. But Karp has recycled it by adapting it to early infancy. He says, ‘Think of your child as a chimpanzee from the age of 12 to 18 months’.3 Then, says Karp, he goes through a Neandertal stage—he’s from ‘two million years ago’. From 24 to 36 months, your child is a ‘more socially advanced cave-kid’. And the three-year-old filling her bag with toys—she is now a ‘villager-gatherer’ from around ‘50,000 years ago’. Karp says to use short phrases, be repetitive, and get close to the level of energy the child displays. Sleep problems, toilet training problems, even separation anxiety and nail-biting—all, he would say in his apparently soothing hypnotic voice, are ‘classic Neandertal self-expression’. However, even if evolution were true, and even if Neandertals were our evolutionary ancestors (which even many evolutionists dispute), how would anyone know how Neandertals expressed themselves? However, whether any particular approach to modifying behaviour ‘works’ or not, it does not logically follow that the theories it is based on are therefore necessarily correct or otherwise.4 For example, when Freudian psychoanalysts were plentiful, many patients experienced at least some relief from seeing them. But most behaviour researchers now believe that such improvements did not reflect the largely discredited notions of Freud so much as the time and attention shown the patient. Similarly, whether or not Karp’s ‘tricks’ work on some children, it does not follow that either his idiosyncratic theories or any alleged evolutionary ideas of human origins are thereby supported. Unfortunately, though, any improvement noted by parents desperate to control their young toddlers will tend to reinforce evolutionary beliefs. And Karp’s book and its credo have hit the scene at a time when parents may be particularly ripe for anything that promises to help. Childhood behaviour problems are at an all-time high. It is probably no coincidence that this comes when we have a generation of children in the West who are on average more self-indulged, and getting less of their parents’ time and attention, including loving discipline, than ever before. Much of this is due to the general erosion of social values and norms, which were to a large extent based on the Bible. The teaching of evolution and its long-age history, in opposition to that of the Bible, has done more to undermine confidence in the Bible than anything else. Thus, ironically, the finger of blame for today’s explosion of bad behaviour may, in a sense, indeed be placed on evolution, only not in the way Karp and his Hollywood groupies would have it. Evolutionary psychology: how credible is it? Many of the explanations of ‘evolutionary psychology’ seem to make sense on the surface—given evolution in the first place. Because one is really dealing with ‘just-so’ storytelling, it’s amazing how easy it is to find some way in which any given behaviour might have benefited our supposed primitive ancestors. Take the maternal instinct—women’s caring for their children. Evolutionary psychology would say this is because genetic accidents which tended to produce this behaviour would be more likely to be passed on than those which did not. This is simply because babies that are looked after are more likely to survive (and hence pass on their mother’s genes) than those which are not. But notice how the same maternal instinct makes just as much sense when it is explained as a created, God-given urge. And it is easy to overlook the fact that such reasoning can explain virtually any behaviour, which means that in reality it explains nothing. For example, what if women routinely lost affection for their children at about the age of 10? Well, evolutionary psychologists could ‘explain’ this, too. At that age, the children are more readily able to survive than infants, so it is now in the interests of the mother’s genes to divert her attention to caring for the next batch of infants. Birkhead, T., Strictly for the birds, review of The Mating Mind by Geoffrey Miller, New Scientist166(2238):48–49, 13 May 2000. Tattersall, I., Whatever turns you on, review of The Mating Mind by Geoffrey Miller, New York Times Book Review, 11 June 2000. 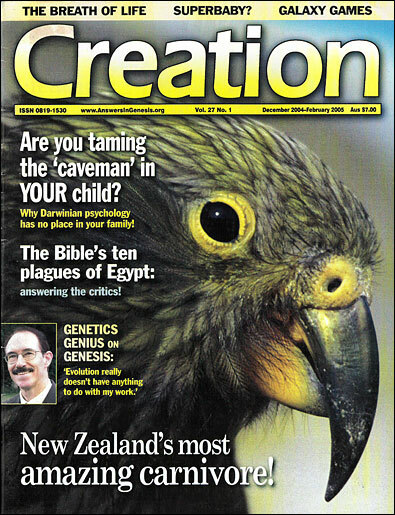 Wieland, C., ‘Evolution made me do it!’Creation 22(3):4, 2000. Grigg, R., Ernst Haeckel: Evangelist for evolution and apostle of deceit, Creation 18(2):33–36, 1996; Fraud rediscovered, Creation 20(2):49–51, 1998. Daily Express (UK), 29 March 2004, p. 35. For example, various diets claim to be based on how our ancestors ate when they were in the Garden of Eden. Others claim to reflect a competing ideology; how our ancestors ate when they were primitive cavemen. But the extent to which any of these ‘work’ or not does not necessarily support the underlying theory of origins. See Wieland, C., Living (and eating) like a caveman? Creation 23(3):6, 2001.